Volunteer Wellington recently received funding for their 2016 programme ‘Our diverse community: coming together through volunteering’. Charlie Devenish, their Funding Advisor told us how this successful programme works. WCT: What’s the background to this programme? CD: We have always worked with people and communities from migrant and refugee communities. In 2015, we offered volunteering opportunities to 610 people from 70 different ethnic backgrounds. We expect about the same number of people to take part this year. Burmese refugee Zin Oo started volunteering at the Citizens Advice Bureau so she could learn more about NZ law and go on to study social work. WCT: How do migrants and refugees get involved? CD: They come in for an informal interview so we can find out about their interests, their skills and the time they have for volunteering. We search our database and usually give them introductions to 4 or 5 organisations where they could contribute. We then follow up a few weeks later to see how they’re getting on. WCT: What kinds of things do they help with? CD: A really broad range – it often depends on their motivation. Quite a few people use the opportunity to improve their English, and so volunteer in charity shops or other retail situations. People with skills in accounting and IT often want to get some local experience and to build up their professional networks. 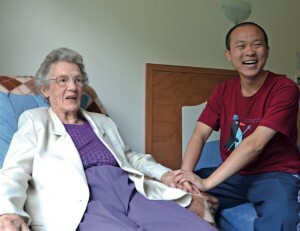 Bright Shao, from Liaoning Province in China’s north-east volunteers with the elderly because he misses his grandparents. For many, it’s about meeting new people and making friends in their new country. They have interests such as animal welfare, conservation, arts and culture, sport and health. We’ve noticed recently that migrants who miss their family, especially their grandparents, decide to volunteer at a rest home. It’s a good opportunity for them to connect with people from their grandparents’ generation. Isaak Ibrahim Hamed Mohammed from West Sudan is a qualified nurse who was severely injured when his hospital in Dafur was bombed. 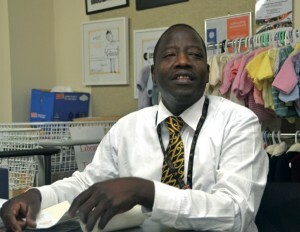 He volunteers for the Wellington Hospitals Foundation doing everything from stuffing envelopes to making up emergency packs for patients who unexpectedly find themselves in hospital. WCT: What do they get out of it? CD: It’s not only the volunteers who benefit, but also the organisations they work for. Volunteering is fun, and can bring new perspectives and skills for all involved. Our volunteers find friends, jobs and connections in their new communities. The organisations get access to skills they may not have, and they’re able to get work done that they wouldn’t normally have time for, often a real luxury when resources are stretched. © 2019 Wellington Community Trust.